Occasionally, I come across people who really impress me. Sometimes these are living people, many times they have died long ago. I usually become acquainted with these “dead” people through something of theirs that I have found or purchased. This is the case with Karl William Scheufler. 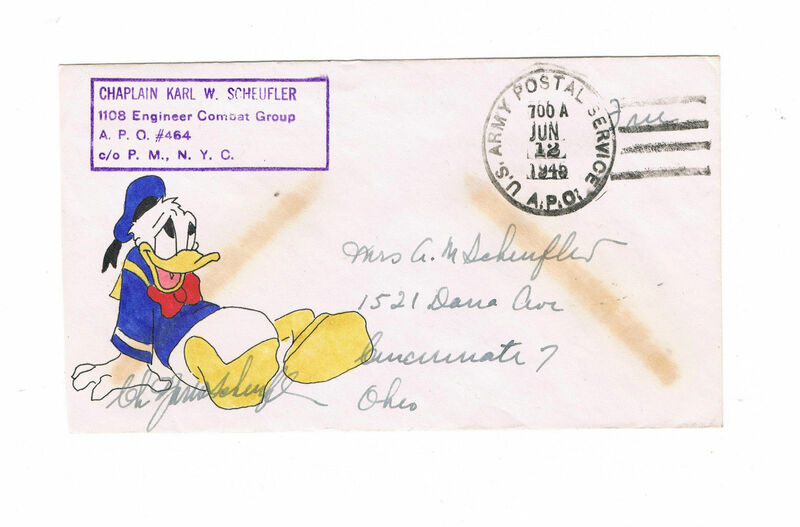 I bought a few postal covers (decorated envelopes) that he had sent to his wife and son during World War Two from Europe. they were mailed during wartime from the combat zone, two of them in April 1945 just before the end of the war in Europe and one in June, just after. Third, there is an interesting cachet on the envelopes (which he later highlighted in a history book he wrote, below). Fourth, they were addressed to his family in Cincinnati, where I am from. Students Army Training Corps, Ohio Wesleyan University, Delaware Ohio, to discharge Private honorable discharge, 19 Dec 18. I’m not certain what this means, whether it is that he spent time in the enlisted Army, or whether this was part of the procedure for being part of what is now ROTC at colleges and universities. Whatever it meant, he later showed “1918” as his original “enlisted in the Army” date when he was serving in World War 2. 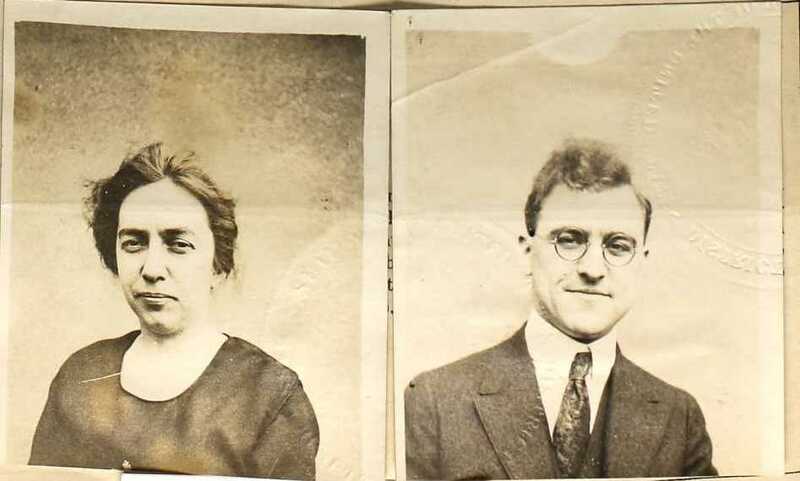 On 23 June 1920, Karl and Ada were married then in 1921, Karl was ordained an elder in the Methodist Church and he and Ada applied for passports to embark on missionary work in China for the Board of Foreign Missions of the Methodist Episcopal Church. His passport was approved and issued on 3 June 1921 and they set sail for China on the S.S. Nile on 17 August 1921. The 1921-22 school year found Karl and Ada at the University of Nanking (China) in the Nanking Language School of the Department of Missionary Training. From there they went to Yenping, Fukien Province as missionaries until 1926. Karl kept meticulous records of not only their own missionary work, but also the interaction of the mission agency as well as what was going on around them in China. The Karl and Ada Scheufler Papers are now in the archives of Yale University Divinity School Library serving as a source of history for this period in China. A combination of the political unrest in China in 1926 and a shortfall in missions funding prevented the Scheuflers from remaining in China after 1926. 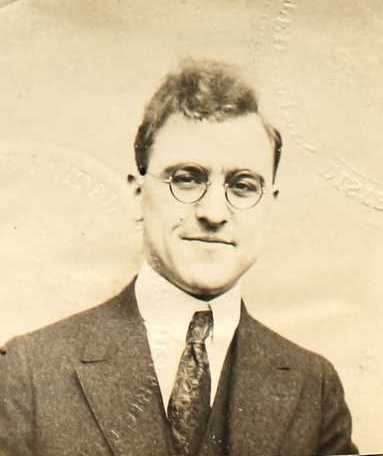 In the 1930s and 1940s until he returned to the Army as a chaplain, Karl was the pastor of Trinity Methodist Church in Cincinnati Ohio and the Scheuflers lived on Auburn Avenue. The 1940 federal census shows that he made $2800 a year in this position. Karl and Ada had two daughters and a son. One of the daughters, Elaine, was born in 1934 the other’s name was Jean. 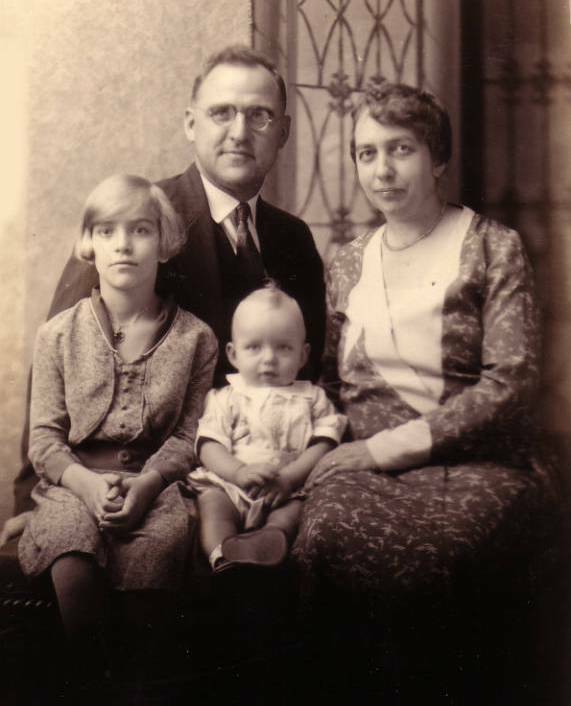 Their son, Lowell, was born in 1931. Lowell went on to follow in many of his father’s footsteps. He began ministering in the United Methodist Church in 1963, serving churches in Columbus and Cincinnati. Lowell also taught for 15 years at United Theological Seminary (Dayton, OH) and the Methodist Theological School of Ohio (Delaware, OH). On 19 December 1942, Karl joined the 355th AAA Searchlight Battalion as a chaplain (captain) and was with them in North Africa and Europe. During his service in World War 2, he drew many interesting cachets (like the one I came across) that fetch several dollars today. Many can still be found for sale. As chaplain, Karl was very busy during the war. 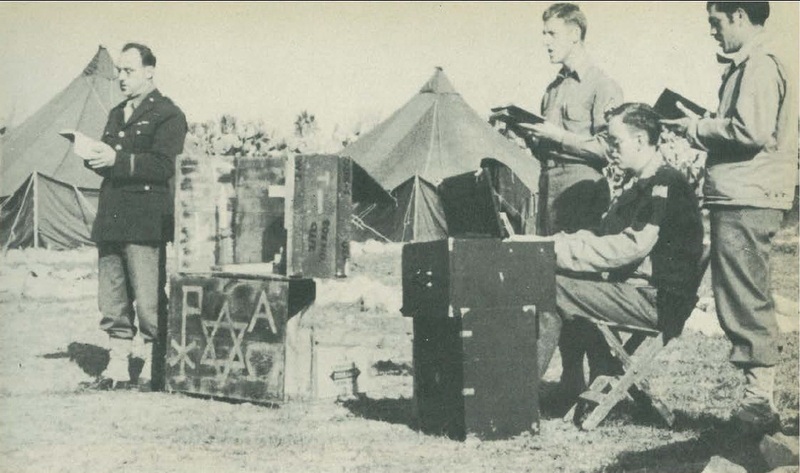 Not only did he provide for the religious needs of his unit by performing worship services, he provided places for Soldiers to relax and have fun. He also guided several R & R trips into Italy for the benefit of the Soldiers in his unit. 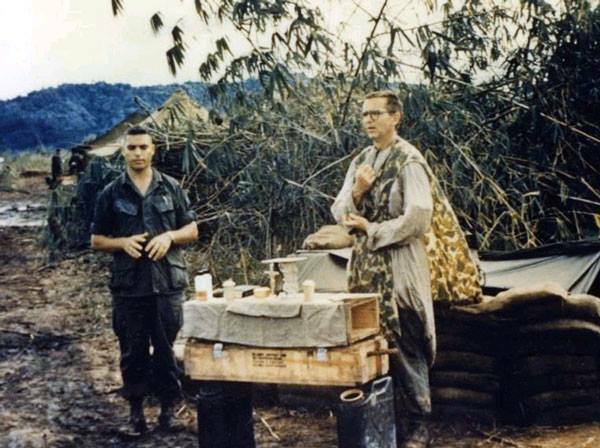 Much of what he did as chaplain in the 355th is spelled out in the regimental history he wrote in 1946, “Carthaginians, Romans and Americans; Overseas with the 355th AAA SLT BN.” Some records indicate that Karl also served in the Philippine Islands. He mustered out of the Army on 30 March 1946, returning home to his family in Cincinnati, Ohio. A few year after the end of the war, the family moved to Columbus Ohio (946 Bryden Road) where Karl continued to pastor in the Methodist Church. Ada died in 1958, then later in life, Karl must have returned to Cincinnati to live out his final years. He died while living in a nursing home on 7 April 1989. Only eternity will tell the number of lives that Karl Scheufler touched while on this Earth. Ministering as a local pastor, missionary to China and chaplain during wartime, his influence would have been enormous and substantial. Numerous, also, would be those inspired by his life; like me, inspired to make a mark in this world -not for fame or fortune but for the Kingdom of God, for the glory of God, for the salvation of souls. If my legacy is only a fraction of Karl Scheufler’s, I will have gone far toward this goal. might be with you and with yours, eternally. ← Is “Gay” the New “Black”? Thank you for this article. 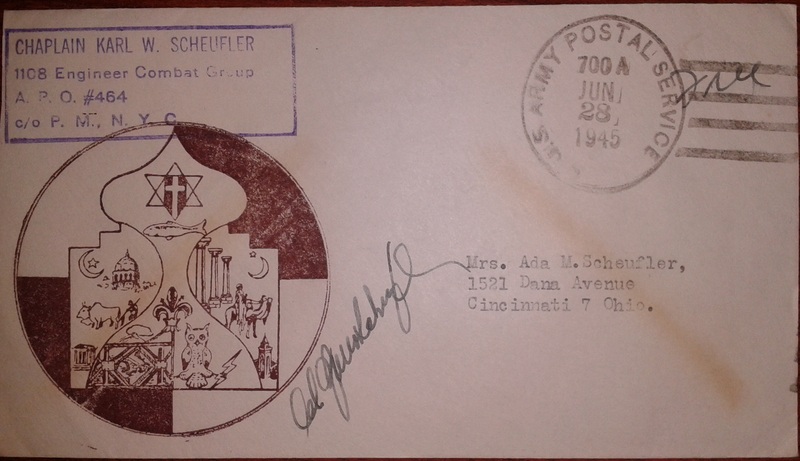 I have a self addressed stamped envelope to Karl W Scheufler, 1521 Dana Ave, Cincinnati 7, Ohio. This was in my father’s WW II “box of stuff”. I was curious who the man was and now I know. My father also served in Africa, Europe, went R & R to Rome and ended in the Philippines. Rev. 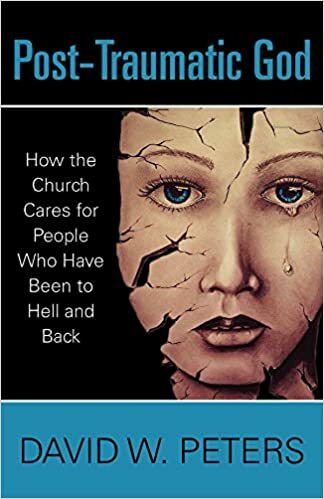 Scheufler, as I knew him while I was a young lad, was the pastor at Grace Methodist Church in Zanesville, Ohio, 50 miles east of Columbus, in about ’50 to ’52. He was energetic, friendly and erudite, and shared with the church’s Boy Scout troop, of which I was a member, his infectious passion for photography. I had a darkroom, and developed black and white photos using the techniques I learned at the parsonage under Rev. Scheufler’s tutelage. I at one time in my life had a copy of “Romans, Carthaginians, and Americans”, but it seems to have gotten away somewhere over the years. 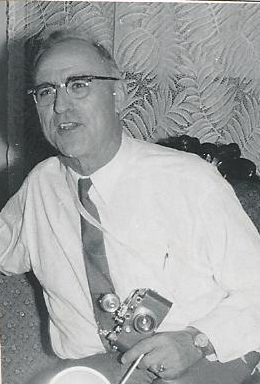 I still do photography and think often about the man who was my favorite pastor of all time. His sermons were intellectual, lively, and often spiced with illustrative incidents from his peripatetic life. A more engaging man I’ve never met! Thanks for sharing, I appreciate the personal memories of Chaplain Scheufler!